"Palestinian Scout Association (literally in Arabic: Palestinian Scouts and Guides Association) - Jerusalem District Scouts and Guides Commission"
Palestinian Media Watch reported recently that the Palestinian Scout Association (PSA) (literally in Arabic: Palestinian Scouts and Guides Association) had held a scouts' course named after terrorist Baha Alyan who murdered 3 Israelis: Alon Govberg, Chaim Haviv, and Richard Lakin, in October 2015. 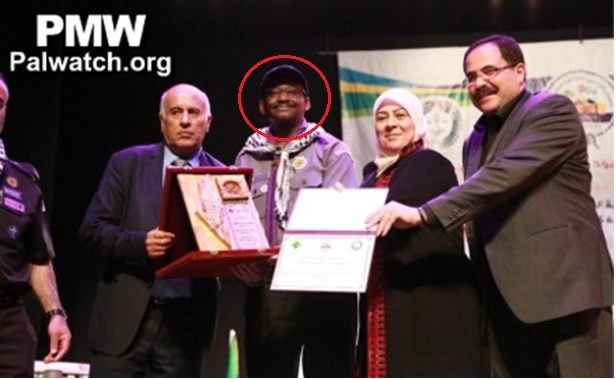 PMW also notified WOSM - the World Organization of the Scout Movement - that the Palestinian Scout Association, a member of WOSM, had named a course after a murderer. After asking for clarifications from the Palestinian scouts, WOSM notified PMW and issued a press release rejecting PMW's charge - saying it was a different Palestinian scout organization that glorified the terrorist, and not the PSA which WOSM has recognized. This PMW report will show that there is conclusive evidence that WOSM has been misled by the Palestinian scouts. In fact there is only one Palestinian Scout Association, and its official name in Arabic is Palestinian Scouts and Guides Association. The Jerusalem Scout Commission which named a course after terrorist Alyan is a branch of the Palestinian Scouts and Guides Association that is a member of WOSM. "Yesterday the practical studies for the [scout] deputy unit leaders (preparation for the wood badge) - Martyr (Shahid) Leader Baha Alyan Course began at the Shabab Al-Eizariya Club in the Jerusalem district. [The course] was organized by the Committee for Training and Developing Leadership of the Palestinian Scouts and Guides Association, in cooperation with the scout commission in the Jerusalem district." "The training staff is composed of several members of the Committee for Training and Developing Leadership: Preparatory studies [course] leader and Jerusalem commissioner Sa'id Atoun, [scout] leader Muhammad Al-Dahdar, and [scout] leader Mufid Al-Barq." As noted above the Training and Developing Leadership committee is a PSA committee. WOSM Press Release: "The website on which the original article [about the Alyan course] was published belongs to a group which calls itself 'The Palestinian Scout and Guide Association' which is not recognised by WOSM. This is the Arabic heading used on the website. The recognised group in Palestine is the 'Palestinian Scout Association.'... Our recognised group has not been able to secure a domain name in Palestine and therefore does not have a website, which adds to the confusion." "The website of the Palestine Scout and Guide Association uses our symbols and branding to give themselves credibility and to give credibility to their views. 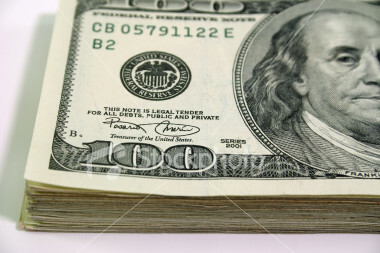 You will understand that in the current climate, there is little we can do about that... The spokesperson for the Palestine Scout Association is Tawfeeq Salem who is the Secretary General." There is only one Palestinian scout organization with one name in Arabic: The Palestinian Scouts and Guides Association. The English name used by the organization is the Palestinian Scout Association (PSA). The Jerusalem Scout Commission that held the course honoring terrorist murderer Alyan is part of this PSA recognized by WOSM. 1. The Palestinian scouts have only one name in Arabic: The Palestinian Scouts and Guides Association. WOSM's spokesperson Stephen Peck was informed by the PSA that there are two different organizations with two different names, and this is not true. The WOSM-recognized PSA's name in Arabic is literally "Palestinian Scouts and Guides Association" - the name that WOSM was told by the Palestinian scouts is a different organization. See for example "Director of the Scouts and Guides leader Tawfeeq Salem." [Ma'an, independent Palestinian news agency, Feb. 29, 2016] Tawfeeq Salem is the person WOSM recognizes as the legitimate PSA Secretary General. This name, "Palestinian Scouts and Guides Association," appears on WOSM's website, in official WOSM events, and in the Palestinian media. There is only one name. There is only one organization. 2. WOSM-recognized PSA Secretary General Tawfeeq Salem - whose name also appeared as the recipient of the official WOSM letter granting full membership to the PSA, on Feb. 27, 2016 - participated in the same celebration and likewise refers to the PSA and its full membership in WOSM. PSA Secretary General Tawfeeq Salem: "We bless the entire Palestinian people and the Palestinian Scout [Association] on our full membership in the World Organization of the Scout Movement [WOSM]. This recognition was achieved following the effort of all of the Arab states and the scout leaders inside [the PA], the homeland, and the diaspora, the effort of the senior leaders, the effort of the Arab Scout Association led by [Director of the Arab Region of WOSM] Dr. Atif Abdelmageed and the World Scout Bureau [WSB]. [This recognition] was also achieved with the support and guidance of Jibril Rajoub - Chairman of the Supreme Council [for Sport and Youth Affairs], Chairman of the Palestinian Scout Association." 3. PSA Executive Committee member Mufid Al-Barq, who in August was an instructor in the Baha Alyan Course, also spoke about becoming a full member in WOSM: "The Palestinian scout movement has great significance, as it is one of the oldest Palestinian youth movements, and it was established over 100 years ago. It is one of the pillars of the young Palestinians... 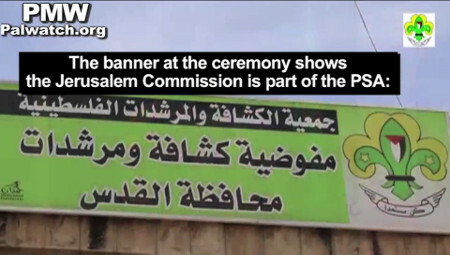 Praise Allah, in recent days and months, thanks to the efforts of the Arab brothers, leaders, and colleagues, we have achieved full world recognition with the right to vote and nominate in the Arab and world [scout] organization [WOSM]..."
A banner at the ceremony also shows explicitly that the Jerusalem Commission is part of the PSA and WOSM. 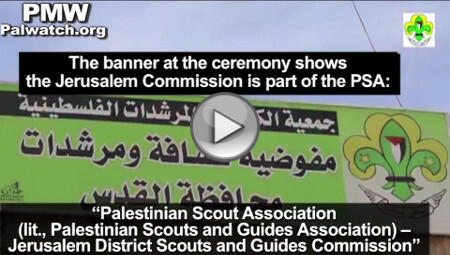 Text on banner: "Palestinian Scout Association (literally in Arabic: Palestinian Scouts and Guides Association) - Jerusalem District Scouts and Guides Commission"
These facts prove without a doubt that the Jerusalem Scout Commission is a branch of the same single organization, known in Arabic as: The Palestinian Scouts and Guides Association (PSA), which is a member of WOSM. 3. Meeting of PSA scout course instructors included WOSM-recognized PSA Secretary General Tawfeeq Salem and the three instructors who later taught the terrorist Baha Alyan course - all identified as being part of the same PSA. The Palestinian Supreme Council for Sport and Youth Affairs invited all PSA scout instructors to a "historic meeting of the training leaders" in Ramallah. 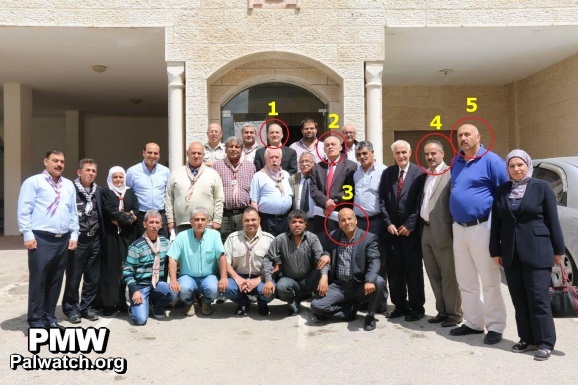 A photo of the participants in the meeting and the accompanying article clearly identified WOSM-recognized PSA Secretary General Tawfeeq Salem and the three instructors from Jerusalem who taught the terrorist Baha Alyan course as part of the WOSM-recognized PSA. 4. Tawfeeq Salem, recognized by WOSM as Secretary General of the PSA. 5. Maher Muhaisen, Chairman of the Jerusalem Scout Commission. Present at the meeting were training leader... Muhammad Darwish Al-Dahdar, ... and likewise training commander aides [PSA Secretary General] Tawfeeq Salem, Mufid Al-Barq, ... Sa'id Atoun, ... and Head of the Jerusalem District [Scout] Commission Maher Muhaisen (among 21 others listed -Ed.)." PMW again stresses that the names above in bold include the instructors in the Alyan course, the head of the Jerusalem Commission, as well as the WOSM-recognized PSA Secretary General, again proving they are all in the one organization. "The Palestinian Scouts and Guides Association completed the project for services to those fasting [during Ramadan] at the blessed Al-Aqsa Mosque... with the presence and participation of the Arab scouts delegation. It was led by Secretary-General of the Arab Scout Organization and Director of the Arab Region of the World Organization of the Scout Movement (WOSM) Dr. Atif Abdelmageed, and leaders of the Tunisian, Jordanian, and Gaza Strip scout movements... The delegation, together with leaders of the Jerusalem District Commission, visited the blessed Al-Aqsa Mosque during the events of National Week of the Palestinian Scouts, which was launched by the Supreme Council for Sport and Youth Affairs and the [Palestinian Scout] Association leadership in order to celebrate the fact that the Palestinian Scouts regained full membership in the World Organization of the Scout Movement [WOSM]. The Jerusalem District Scout Commission opened with the standard procedures as every Friday. Chairman of the Jerusalem District [Scout] Commission Governing Body Maher Muhaisen spoke in his speech about the special importance of this day, and about the importance of the Arab delegation that arrived at the blessed Al-Aqsa Mosque. Receiving the [Arab scout] delegation were [scout] leaders Maher Muhaisen, Muhammad Abu Suwai, Nasser Qaws, and several leaders of the Jerusalem [scout] troops. They accompanied the delegation together with several Jerusalem leaders... Following the afternoon prayer at the Al-Aqsa Mosque, the Jerusalem Commission left together with the visiting delegation for a tour of the Old City... Chairman of the Supreme Council for Sport and Youth Affairs and Chairman of the Palestinian Scout Association Jibril Rajoub joined the tour in a surprise visit... [WOSM Director] Dr. Atif Abdelmageed, in his closing speech, expressed his deep thanks for the activity and the giving, and the effort of the Jerusalem scouts for the worshippers." Below are four pictures from PSA events. The first picture (upper left) is from a ceremony celebrating the granting of WOSM membership to the PSA, held under the auspices PA Chairman Mahmoud Abbas in Ramallah. WOSM's Director of the Arab Region and Secretary-General of the Arab Scout Organization Atif Abdelmageed is standing next to Jibril Rajoub, Chairman of the Palestinian Scout Association. This shows WOSM official Abdelmageed's role of working with the PSA. 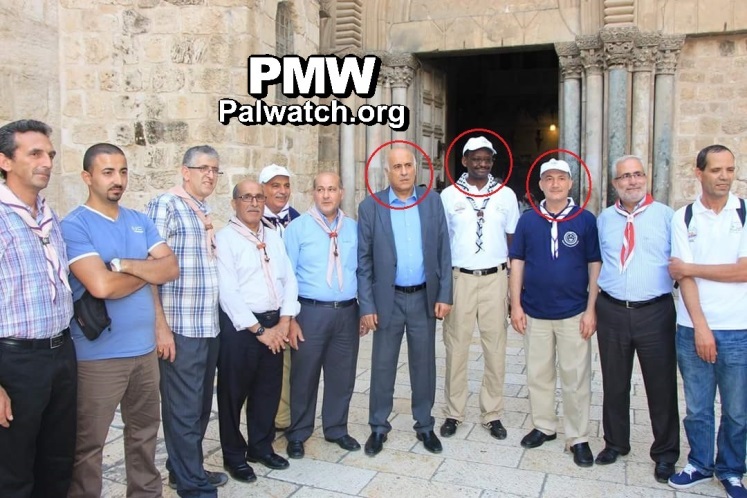 In the other three photos, and mentioned in the article above, Abdelmageed is being led on a tour by Jerusalem Scout Commission members and poses with them for pictures. This shows the Jerusalem Scout Commission's central role in PSA events and the PSA's role as host of WOSM official Abdelmageed. 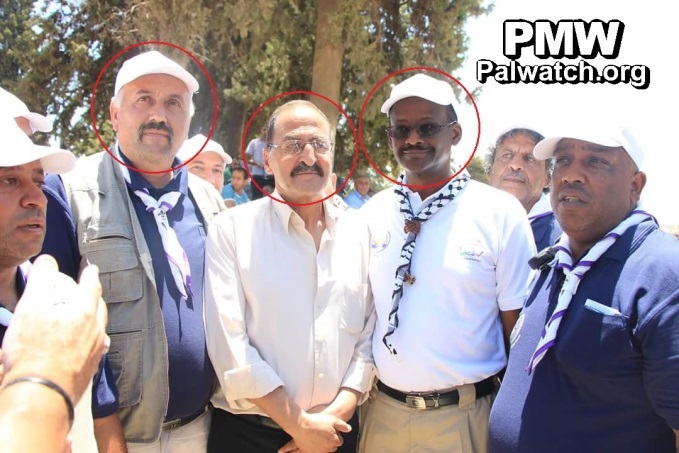 In the photo below on the upper right, the same WOSM official, Atif Abdelmageed (right), is posing for a picture with Chairman of the Jerusalem Scout Commission Maher Muhaisen (left) and the father of terrorist Baha Alyan (center). 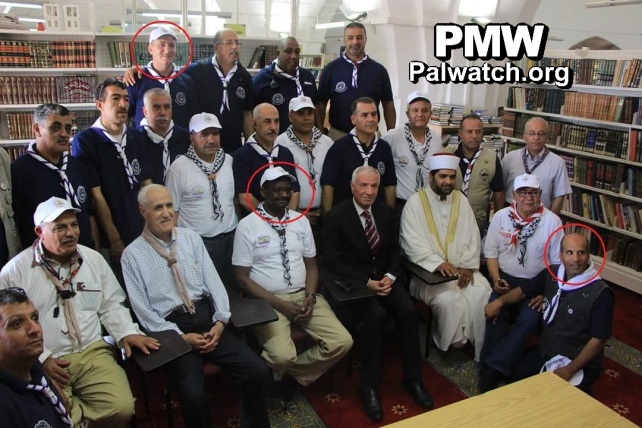 In the third photo below (lower left), WOSM's Abdelmageed poses with Chairman of the PSA Jibril Rajoub and Mufid Al-Barq, who was later one of the instructors of the terrorist Alyan course held by the Jerusalem Scout Commission. In the fourth photo, Abdelmageed is seen in a group photo with Mufid Al-Barq and Sa'id Atoun - both Alyan course instructors. The connection between WOSM and the PSA's Jerusalem Scout Commission is seen by WOSM's Abdelmageed participating in their event and posing for photos with the head of the PSA, the Chairman of the Jerusalem Commission, as well as with the instructors of the terrorist Alyan course. From left to right: Chairman of the PSA Jibril Rajoub, Secretary-General of the Arab Scout Organization and Director of the Arab Region of the World Organization of the Scout Movement (WOSM) Dr. Atif Abdelmageed, PA District Governor of Ramallah and El-Bireh Laila Ghannam, and PA Minister of Education Sabri Saidam. [Official Facebook page of PA District Governor of Ramallah and El-Bireh Laila Ghannam, June 22, 2016] Photo of WOSM official Dr. Atif Abdelmageed (right) with Chairman of the Jerusalem Scout Commission Maher Muhaisen (left) and Muhammad Alyan (center), father of terrorist murderer Baha Alyan, during a tour of the Al-Aqsa Mosque plaza together with representatives of Arab scout organizations to celebrate the PSA's acceptance into WOSM. From left to right: Chairman of the PSA Jibril Rajoub, Director of the Arab Region of the WOSM Dr. Atif Abdelmageed, and Baha Alyan course instructor Mufid Al-Barq. From left to right: Baha Alyan course instructor Mufid Al-Barq, Director of the Arab Region of the WOSM Dr. Atif Abdelmageed, Baha Alyan course instructor Sa'id Atoun. 6. Another important meeting shows the structure of the Palestinian Scout Association. It likewise included Tawfeeq Salem, the WOSM-recognized PSA Secretary General. It shows that the PSA is divided into districts/commissions throughout the West Bank and that this includes the Jerusalem commission which ran the terrorist Alyan course. Headline: "The director of the scouts in the Supreme Council met with the heads and secretaries of the commissions"
"Director of the Scouts and Guides in the Supreme Council for Sport and Youth Affairs Mr. Osama Abu Karsh held an important meeting with all of the administration heads and secretaries of the commissions of the northern districts (i.e., West Bank) at the council headquarters in Ramallah, in the presence of Director of the Scouts and Guides leader Tawfeeq Salem, and head of the scout division leader Shaher Harun. It should be noted that the following people from the northern districts were present at the meeting: Leaders Maher Muhaisen (i.e., head of the Jerusalem Commission) and Hamza Al-Rifa'i from Jerusalem, Husam Dandis and Nu'man Salhab from Hebron, Walid Al-Shatla and Shawkat Matar from Bethlehem, Yaqub Jubran and Ahmed Tamliyeh from Ramallah, Ayman Matar and Muhannad Al-Sadda from Nablus, Osama Bisharat and Ayed Ja'aiseh from Tubas, and leader Muhammad Khashan from Jericho." "During the tour [of the Al-Aqsa Mosque plaza], [WOSM] leader Dr. Atif Abdelmageed met with lawyer Muhammad Alyan, the father of Martyr (Shahid) leader Baha Alyan and one of the most prominent leaders and activists in the service of the blessed Al-Aqsa Mosque." Following PMW's report on the course honoring the terrorist, and the PSA and WOSM's connection thereto, this article has been taken down from WOSM's website. PMW has not heard if WOSM has taken or intends to take any disciplinary measures against Dr. Atif Abdelmageed for meeting with and posing for a picture with the father of the terrorist murderer of three. Conclusion: The WOSM-recognized PSA did in fact run the "Martyr Baha Alyan Course"
In the video and the articles cited above and in many other articles, the Palestinian media has referred to one organization: "The Palestinian Scouts and Guides Association" - the PSA in English. No one has mentioned that there are two organizations using the same name. No one has said that the Jerusalem branch is not part of the PSA. The representatives of WOSM and the instructors in the terrorist "Alyan Course" are participating in the same events and are celebrating PSA membership in WOSM together. They are all appearing at the same PSA events, training courses, and celebrations. The Director of the Scouts and Guides in the Supreme Council for Sport and Youth Affairs Osama Abu Karsh talked about the Supreme Council for Sport and Youth Affairs' goal to "strengthen the Palestinian Scouts and Guides Association which represents all of the scouts in the homeland." The only conclusion to reach is that WOSM was falsely told by the PSA that there are two organizations. PMW's research found no reference anywhere to two different organizations and the evidence shows beyond a doubt that the Jerusalem Scout Commission is part of the PSA that has membership in WOSM. Accordingly, it was the WOSM-affiliated PSA that ran the "Martyr Baha Alyan Course." One final point to be made is that Jibril Rajoub, by virtue of his role as the Head of the Supreme Council for Sport and Youth Affairs, serves as the Chairman of the Palestinian Scout Association. PMW has long documented Rajoub's open support for terror and incitement to murder, and recently published The Rajoub File documenting numerous examples of Rajoub's praise for terror, encouragement of violence, and his involvement in naming sporting events after terrorists. Given Rajoub's role as Chairman of the PSA, it is not surprising that the scout organization held a course named after a terrorist. Video from the ceremony in Ramallah, June 21, 2016, celebrating the full membership of the Palestinian Scout Association (PSA) in the World Organization of the Scout Movement (WOSM). 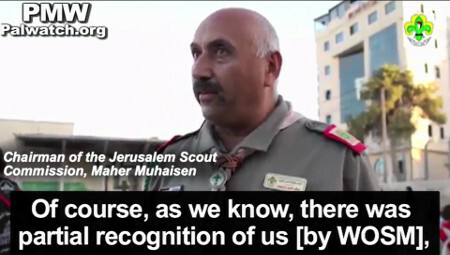 Chairman of the Jerusalem Scout Commission, Maher Muhaisen: "Of course, as we know, there was partial recognition of us [by WOSM], but it was revoked because we had problems with the Israelis. Praise Allah, we have succeeded in taking back the right... The Palestinian Scout [Association] has existed from 1912 and until today..."
PSA Executive Committee member and Baha Alyan Course instructor (August 2016), Mufid Al-Barq: "The Palestinian scout movement has great significance, as it is one of the oldest Palestinian youth movements, and it was established over 100 years ago. It is one of the pillars of the young Palestinians. When we say 'recognition of the Palestinian Scout [Association],' we are not only talking about the scout movement, because this is part of the recognition of the [entire] Palestinian entity and the Palestinian youth. Honestly, we have been recognized [by WOSM] since the beginning of the 19th century, with the founding of the scout movement (sic. ), but until now the situation was bad, because this recognition was revoked... But praise Allah, in recent days and months, thanks to the efforts of the Arab brothers, leaders, and colleagues, we have achieved full world recognition with the right to vote and nominate in the Arab and world [scout] organization [WOSM]..."
Gaza Scout Commission member, Faisal Abu Sakr: "This is a great honor for us. We are getting to know all the scouts - our boys, girls, our guides - all of the adult scouts in the West Bank. We are all one body, one homeland, and there is no difference between the Gaza Strip and the West Bank..."
Jibril Rajoub also holds the following positions: Chairman of the Palestinian Football Association and Chairman of the Palestine Olympic Committee. "Yesterday the practical studies for the [scout] deputy unit leaders (preparation for the wood badge) - Martyr (Shahid) Leader Baha Alyan Course began at the Shabab Al-Eizariya Club in the Jerusalem district (Note: Alyan was terrorist who murdered 3, Ed.). [The course] was organized by the Committee for Training and Developing Leadership of the Palestinian Scout Association, in cooperation with the scout commission in the Jerusalem district. The training staff is composed of several members of the Committee for Training and Developing Leadership: Preparatory studies [course] leader and Jerusalem commissioner Sa'id Atoun, [scout] leader Muhammad Al-Dahdar, and [scout] leader Mufid Al-Barq." Headline: "The Commission for Developing Leadership holds an important meeting of the training leaders and their aides in the northern districts"
"Under the auspices of the Supreme Council for Sport and Youth Affairs, the Committee for Developing Leadership in the northern districts (i.e., the West Bank) held its historic meeting of the training leaders and the aides of the training leaders in the West Bank at the auditorium of the Supreme Council for Sport and Youth Affairs in Ramallah. "Director of the Scouts and Guides in the Supreme Council for Sport and Youth Affairs Mr. Osama Abu Karsh held an important meeting with all of the administration heads and secretaries of the commissions of the northern districts (i.e., West Bank) at the council headquarters in Ramallah, in the presence of Director of the Scouts and Guides [scout] leader Tawfeeq Salem, and head of the scout division leader Shaher Harun. It should be noted that the following people from the northern districts were present at the meeting: Leaders Maher Muhaisen and Hamza Al-Rifa'i from Jerusalem, Husam Dandis and Nu'man Salhab from Hebron, Walid Al-Shatla and Shawkat Matar from Bethlehem, Yaqub Jubran and Ahmed Tamliyeh from Ramallah, Ayman Matar and Muhannad Al-Sadda from Nablus, Osama Bisharat and Ayed Ja'aiseh from Tubas, and leader Muhammad Khashan from Jericho." Headline: "Project for services to those fasting at the blessed Al-Aqsa Mosque, 2016"
"The Palestinian Scout Association (PSA) (literally in Arabic: The Palestinian Scouts and Guides Association) completed the project for services to those fasting at the blessed Al-Aqsa Mosque [during Ramadan]. The number of worshippers who arrived to pray at the Al-Aqsa Mosque plaza every Friday - according to what the Waqf gave - was over 250,000. The blessed Fridays were special and of a prominent Arab scouting nature, with the presence and participation of the Arab Scout [Organization] delegation. It was led by Secretary-General of the Arab Scout Organization and Director of the Arab Region of the World Organization of the Scout Movement (WOSM) Dr. Atif Abdelmageed, and leaders of the Tunisian, Jordanian, and Gaza Strip scout movements. The delegation, together with leaders of the [PSA] Jerusalem District Commission, visited the blessed Al-Aqsa Mosque during the events of National Week of the Palestinian Scouts, which was launched by the Supreme Council for Sport and Youth Affairs and the [Palestinian Scout] Association leadership in order to celebrate the fact that the Palestinian Scouts regained full membership (sic., they were not previously full members) in the World Organization of the Scout Movement. The Jerusalem District Scout Commission opened with the standard procedures every Friday. Chairman of the [PSA] Jerusalem District [Scout] Commission Governing Body Maher Muhaisen spoke in his speech about the special importance of this day, and about the importance of the Arab delegation that arrived at the blessed Al-Aqsa Mosque. The person in charge of public relations and communications [scout] leader Muhammad Abu Suwai spoke and encouraged the scouts to act as they did on the previous two Fridays, and in the same spirit of giving, ...and [emphasized] the importance of this day for the Scout movement of Jerusalem. Afterwards, the participants were divided among the various areas of the Al-Aqsa Mosque, whose territory is 144 dunams (over 35.5 acres), by the person in charge of the activity, [Jerusalem] Scout Commissioner Sa'id Atoun. Receiving the [Arab scout] delegation were [scout] leaders Maher Muhaisen, Muhammad Abu Suwai, Nasser Qaws, and several leaders of the Jerusalem [scout] troops. They accompanied the delegation together with several leaders of the Jerusalem troops from the start of their arrival at the tour of the Al-Aqsa Mosque plaza, while they explained the important role placed upon the scouts, and the activity of protecting and keeping the order of the worshippers at the blessed Al-Aqsa Mosque. Dr. Atif Abdelmageed, in his closing speech, expressed his deep thanks for the activity and the giving, and the effort of the Jerusalem scouts for the worshippers." Baha Alyan and Bilal Ghanem - 22 and 23-year-old Palestinian terrorists who on Oct. 13, 2015, boarded a bus in Jerusalem's Armon Hanatziv neighborhood with a gun and a knife and attacked passengers, killing Israelis Chaim Haviv (78) and Alon Govberg (51), and Richard Lakin (76), and wounding 3 Israelis. Alyan was shot and killed by an Israeli security guard at the scene and Ghanem, a Hamas terrorist who served time in Israeli prison in 2013-2014, was wounded. Ghanem is serving 3 life sentences and an additional 60 years for these murders.